Sometimes, aperture fever can lead to a severe case of brain damage. The kind that compels you to make a purchase that by all acceptable standards would be considered insane. Such is the case for those who decide to buy a gigantic binoscope. Already much has been said about the huge disadvantages of the binodobson. After all, there must be a reason why almost no telescope manufacturing company offers them. But are these prejudices true or are they merely based on assumptions without any real experience to back them up? 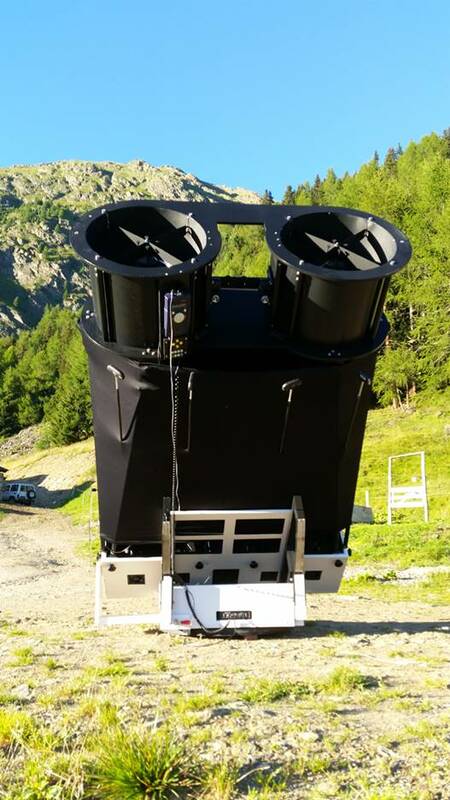 In order to find out, me and my friends of the astronomical society of Trentino in northern Italy have put my new 18” binodobson to the test. 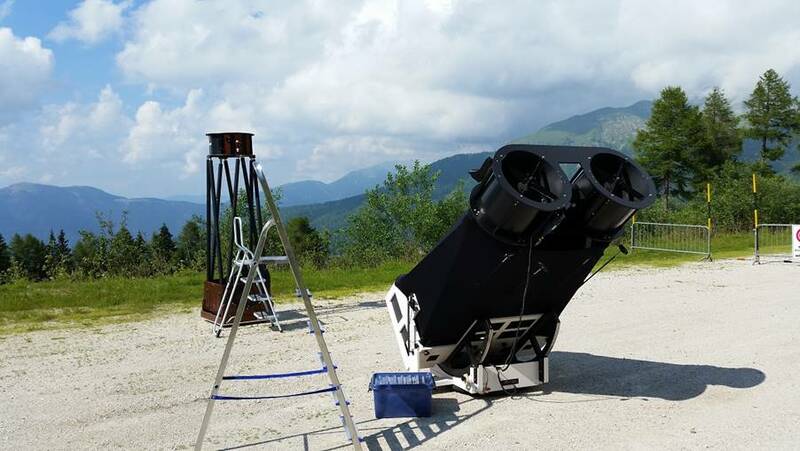 This binodobson was built in Holland by the well-known telescope builder Mr. Arie Otte. The work on this gem took him no less than 15 months and you can imagine how thrilled I was when he finally delivered it over a month ago. After decades of observing with one eye only, I found cyclops observing ever more tiresome. Eyepatches didn't help and so I turned to binoviewers. I have owned or tried nearly every kind of binoviewer, from the cheap Chinese over the fabulous Denk II to the jaw-dropping 2” Siebert. But unfortunately none of them managed to really impress me in the end. Vignetting, unwanted extra magnification and most of all light loss (yes, even with the 2” model) increasingly frustrated me. So there was only one option left: a big binoscope. There's not a lot of reliable information available but every article that I did find, talked in superlatives about this type of telescope. So I ordered one. It was a scary leap into the dark because a binodobson’s not really cheap and of course I didn't really have the opportunity to try one first. Then there were all the negative comments of which I talked earlier. But Mr. Otte replied to all of my concerns with great patience and with solid, scientific arguments. So I went for it. First let’s talk about numbers. The binodobson’s 145cm wide, 220cm high and weighs about 150kg (330lbs). So it's big… very big. Optics are two 18” mirrors by Nichol which are carved to f/5. Lower focal lengths would make the optics too collimation critical and as we shall see the collimation of a binodobson is not child’s play. The scope came complete with fans (also for the boundary layer), Telrad, wheelbarrow handles, lightshroud, heated secondaries, Argo Navis and ServoCat, which are driven by three heavy-duty internal and rechargeable batteries. An additional problem that I had to solve, was the fact that for the time being I'm living in an area which is absolutely terrible for astronomical observing. 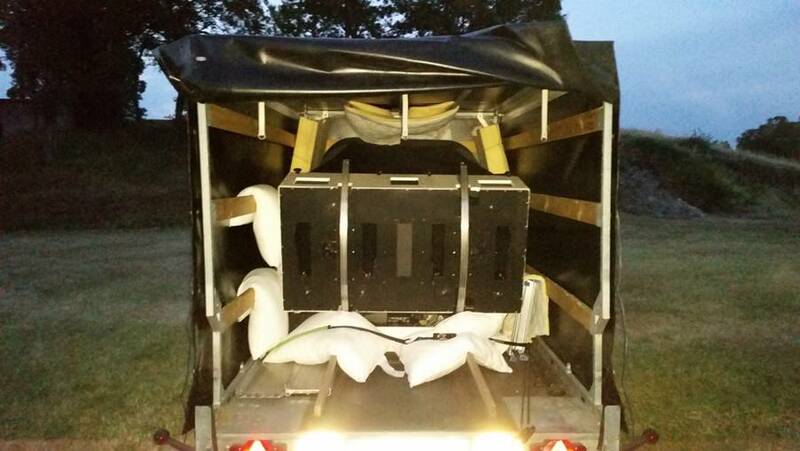 So I decided to buy a special trailer in which I can take the binoscope up in the mountains (a 20-min drive), big enough so I don't have to mount/dismount the scope every time, which would be a nightmare. A word about collimation. A binodobson requires the collimation of two dobsonians in stead of just one. Fortunately Mr. Otte foresaw long rods which allow collimation of the primaries from the eyepieces. These rods serve for the alignment of the tubes as well, but I'll come back to that later. Furthermore, a binodob has two tertiary mirrors which also have to be collimated of course. This can be done very easily with three knobs under the tertiary mounts and normally should remain good for a long time, just a quick verification every now and then. Then you have to wait until it's dark enough to see some stars and verify if the tubes are well aligned. Usually the stars will be somewhat off between one eyepiece and the other. Perfect alignment is achieved through turning the collimation rods of one of the primaries, therefore slightly miscollimating it. Most of the time this error’s too small to be noticeable. However, should the collimation error become apparent, you have to recollimate the primary in question by moving it laterally. And here comes a bit of genius of Mr. Otte. The primaries aren’t held by a classic belt, Kriege style, but simply rest on two ball bearings. (Un)screwing these bearings moves the primary laterally and perfect collimation is achieved with the tubes aligned. This is something that has to be done only rarely and after getting the hang of it, the complete collimation of this binoscope’s done in… 5 minutes! Now we come to the heart of the matter… how does a binoscope compare to a monocular telescope? In theory a binoscope offers the same performance of a telescope 1,42 times its diameter. In the case of my 18” binoscope, that would be a 25” monocular scope. But that's just optical theory when talking about light gathering power and resolution. In practice a binoscope offers much more contrast and on faint objects delivers like a telescope up to 1,8x its diameter! In my case that would be a 32” monocular scope! The reason for this is that when observing at the limits, the eye accepts a lot of “false” light signals. But the chance that such a false signal’s accepted by both eyes simultaneously is a lot less of course. That's the reason why the background becomes darker with binocular viewing and contrast’s enhanced significantly. In order to find out how significantly, my friends put the 18” binodobson next to two high-quality 20” dobs, one f/5 Starsplitter II with Galaxy optics and one incredibly beautiful f/3,7 custom-built. Location was mount Panarotta at almost 2000m of elevation and a sky with an SQM of 21,2. In the end there was no competition whatsoever. 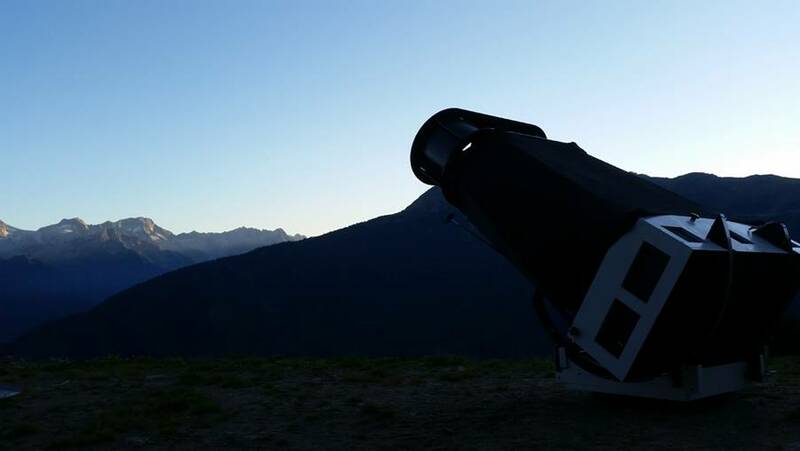 The binodobson brought out details which you could only dream of in the 20”, without wanting to depreciate the spectacle that also these telescopes offered. One example was the beautiful planetary NGC6905 in Delphinus (the “Blue Flash”), which showed its entire internal structure and filaments, just like on a high-quality photo. One of my friends later commented that this planetary had been the star of the evening. All agreed that contrast was far superior and commented with great enthusiasm on the 3D-feel that binoscope viewing offered. For the first time I have the impression that visual observation comes close to highly-detailed photography. Averted vision is no longer necessary. When looking for Stephan’s Quintet, the Argo Navis still wasn't aligned well and I ended up on a bright little galaxy which I later identified as NGC7315. It turned out to be mag. 14! I couldn't believe that at first because I had estimated it to be at least mag. 12 at the eyepiece. That's the sort of light gathering power we’re talking about. The Quintet itself was so bright that all 5 members just screamed out at you and I had to return to this object two more times to give the opportunity to others to see it as well because they couldn't believe what their friends had told them. One commented that the binodobson had surpassed by far his wildest expectations. For the first time I have the impression that visual observing shows you almost just as much as a photograph, with very little colour of course. Another big advantage of a binoscope is a much lower minimum magnification. In order to obtain a 7mm exit pupil, a 25” telescope needs to magnify at least 90x. This means that you can forget seeing the entire Orion nebula in the same field of view. An 18” binoscope can go as low as 65x for exactly the same exit pupil and... light gathering power. As regards to resolution, I haven't had a real opportunity to test the scope on the planets yet. But I've never seen doubles so crisp and well-separated. STF6273 for example, also in Delphinus, is fairly tight with its separation of only 2,5”. In the binoscope the components looked as if there were a motorway of black in between them, even at only 104x. Globulars are resolved with breathtaking ease and appear as spheres rather than grainy discs. M15 is a very compact globular, yet in the binoscope at 190x you can identify just about every star in its core. Any negatives? Yes, there are. All telescopes are a compromise and this binoscope isn’t an exception. Apart from its size and complexity to collimate, the biggest disadvantage is the position of the eyepieces. It’s not that staring at the ground in stead of up is so difficult. It’s a habit that you acquire quickly and it has the bonus that all around where you are looking it’s absolutely dark, which adds even more to the unbeatable contrast. But Mr. Otte chose to place the eyepieces exactly between the two tubes, and with good reason too. It reduces the complexity to build and align, it leaves sufficient space between the tubes so that you won’t get disturbed by body heat turbulences and, most of all, it makes it possible to observe objects close to the horizon. If the eyepieces were placed almost under the tubes like in the classical binodobson design, this would become very difficult. The problem however is that placing the eyepieces halfway makes observing at zenith almost impossible. Until about 80° you’re okay with a sufficiently high ladder, but once beyond that you have to bend forward too much to observe without danger of falling down. Perhaps this problem could be overcome with a ladder that has a vertical rear side, but it still won’t be easy. One last word about cost. A binodobson’s often discarded because it's supposed to be too expensive. Needless to say that this 18” has cost quite a bit of money. But surprisingly… significantly less than a 25” Obsession with Argo and ServoCat, if you count in shipping and customs! And it’s at least equal, if not superior in performance. A negative is of course that you always have to buy pairs of eyepieces and filters and this adds substantially to the overall cost. You also have to be careful about which eyepieces you choose because using a couple of 22mm Naglers is possible for most people but the 24mm Explore Scientifics are a no-go because too bulky. On the other hand, the return is simply priceless. Personally I wouldn't hesitate a second if I had to choose between a 25” mono or 18” bino. For some people this may be different because not all are able to observe easily with both eyes. All in all, I can still understand why there are so few binodobsons around. Most of the practical reasons turn out to be false because using this 18” is quite easy, once you get some experience with the collimation procedure. 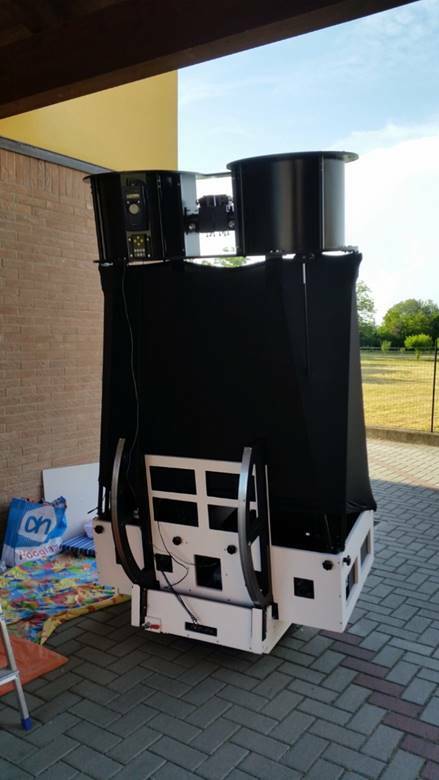 But building one is so incredibly complex and even after having built numerous binoscopes Mr. Otte has encountered a lot of difficulties whilst building mine. But his passion has always prevailed and I feel extremely honoured and privileged that I’ve become the custodian of his latest work of art. It’s only because of people like him that we astronomers can truly enjoy the spectacle of the night’s sky. I’d like to thank him once more for his professionalism, his dedication and above all his friendship and I won’t hesitate to recommend his telescopes to everyone. A scope like this has been on my wish list for quite some time. 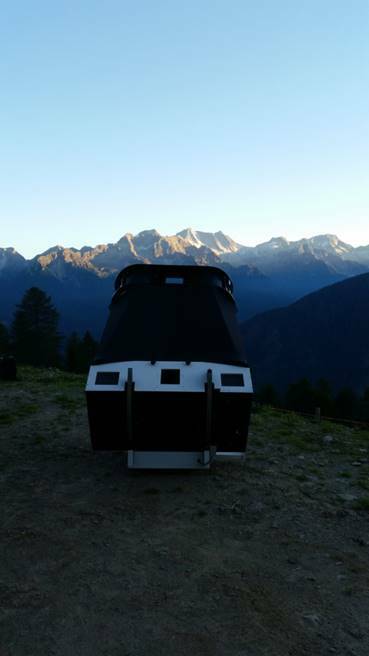 Beautiful instrument, beautiful observing site and I loved reading your review. Your stunning sketches and now your introduction and review of this magnificent instrument have just blown me away with respect to what is possible in visual astronomy! Thanks Peter. Ok...now when I can I drop by for a look? Beautiful scope! Only addition I would like to see on the review is a picture or two, up close, of the viewer and someone at the viewer. For me I'd want f/3.7 max focal ratio. No reason to have it f/5, it's already heavy and bulky enough without adding height. The secondaries in a binoscope have to be larger in order to push the focal plane out sufficiently to allow the tertiary mirrors to fold the light path up to the eyepieces. At f/3.7 for an 18" instrument they would be quite large: around 5.2" (or possibly as much as 5.7" when using a Paracorr after the tertiary) - doable but moving into Schmidt-Cassegrain territory for obstruction ratios. Another useful exercise is to work out the lowest power eyepiece that will not exceed the size of your dark-adapted pupils at various focal ratios (and that are not too large lest they bump into each other). For most of us who are not very young, our pupils will be smaller than the oft-quoted 7 mm. As I mentioned in the review, the main reason why going below f/5 in a binoscope creates big difficulties is collimation and alignment. Slightly miscollimating an f/5 to obtain perfect alignment is no big deal. Slightly miscollimating an f/3,7 is a whole different story! Cheers and you're all welcome to drop by when you're visiting Italy! My dream (if money were no object) would be to have one of these huge binoscopes and couple it with 2 night vision monoculars. That would be deep space Nirvana. The first time I observed with one of the 22" binoscopes I targeted M31. The eyepieces were 30mm 80* and clones of an APM design. With both eyes a number of globular clusters were clearly visible as tiny disks. So of course, I closed one eye, and the disks disappeared, to become stellar objects. Fantastic report, and a beautiful instrument. congrats!! great review, sounds like you are in for a lifetime of enjoyment. I would not hesitate to get one as long as it is for some sort of a permanent setup. Very interesting review. As formerly active ATM (have built a 10" f5 binoscope in my younger days) I just take my hat off for that marvellous engineering. No thing like using 2 eyes. You better get a pair of 13 or 17mm Ethos soon! Quelle bête! I got to say, when I see monsters like this, it makes you wonder why we can't pool our money for sweet town observatories. Un jour! When I look at the photos of this wonderful scope and then look at my little 8" SCT, I get seriously depressed. Congratulations on the scope of a lifetime. Congrats and enjoy! Truly a work of art. Would have loved to see a photo where the eyepieces are at and directed from both dobs. Yep, your insane alright . . . but we all are to some degree or other. Enjoy yourself !!! Thank you for your well-written article. I'll betting that when you view Jupiter with that thing, you will feel you could pluck it from the sky!